We’d love your help. Let us know what’s wrong with this preview of The Story of Civilization by Will Durant. To ask other readers questions about The Story of Civilization, please sign up. Carl Because of the way the copyright laws are written in the US, these volumes will continue to covered by copyright for another 65 years. Since the title says 'story of civilization', can we expect much of eastern history in these volumes too? Especially Indian? Abhay Mishra The first volume specifically covers Indian and Chinese history. I read all 11 volumes of this series when I was housebound with 3 kids (2 of whom were infants). These books saved my sanity and kept my brain from turning to mush. 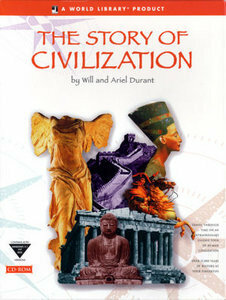 The Story of Civilization, by husband and wife Will and Ariel Durant, is an eleven-volume set. I. Our Oriental Heritage (1935), II. The Life of Greece (1939), III. Caesar and Christ (1944), IV. The Age of Faith (1950), V. The Renaissance (1953), VI. The Reformation (1957), VII. The Age of Reason Begins (1961), VIII. The Age of Louis XIV (1963), IX. The Age of Voltaire (1965), X. Rousseau and Revolution (1967), XI. The Age of Napoleon (1975). Will and Ariel Durant, like Abelard and Heloise, were teacher and student, were punished and went on to write together. Unlike their mediaeval prototypes, however, they wed and appear to have been rather happy. They certainly were productive. Will started the series, the two of them carried it through to "the age of Napolean". Together, they travelled a great deal, visiting many of the places they wrote about in this magisterial eleven volume (twelve if you count a companion volume on historiogra Will and Ariel Durant, like Abelard and Heloise, were teacher and student, were punished and went on to write together. Unlike their mediaeval prototypes, however, they wed and appear to have been rather happy. They certainly were productive. Will started the series, the two of them carried it through to "the age of Napolean". Together, they travelled a great deal, visiting many of the places they wrote about in this magisterial eleven volume (twelve if you count a companion volume on historiography which I've yet to read) history of almost everything. I don't know if it's Ariel's influence, but, unlike H.G. Wells' own, much shorter, attempt at a history of human civilization, their work is remarkable for the attention it pays to culture, domestic life and women in addition to the usual account of literate elites and their doings. The first volume, Our Oriental Heritage, Will's work, is the only disappointment. It attempts to cover both the earliest civilizations and also the history of Asia up to the time of writing. Given the attention paid the West, this is disproportionately little, reflecting either his ignorance or his prejudice. Indeed, were this volume excluded, it would be almost fair to retitle the whole The Story of Western Civilization. Otherwise this is the best general history of the world I've ever seen. Other, equally long series exist, but they are by multiple authors and therefore lack the single voice (or harmonious duo) of the Durants. Naturally, specialists will find the sections they know most about inadequate, but for the general reader the work is just right and there are likely few specialist historians who could equal their work overall. Although long, the reading goes quickly, like a novel. I handled it as bedtime reading over a period of a few months and you can too. I will be reading a hundred pages per month of this series for almost ten years. I will review it more thoroughly in the year 2020. So far, I feel like I am finally getting history to some extent, and all I have read is half of the first book. So far he has covered Egypt, Babylon, Assyria, Persia, and Jerusalem. Now we are hitting India. I love it, really. d- EVERYONE should read this series sometime in their lifetime -- of course it'll likely take you most of a lifetime to actually read the whole thing (it's like 12 volumes of 1,500 pages each). i have it on audio and i've listened up until volume 8 or 9 i think. (I need to get back to it.) it took will durant almost 30 years to write it, and i think the final volume was published back in the 30's. but it is amazing. it was written way back in the first half of the 20th century (although i think d- EVERYONE should read this series sometime in their lifetime -- of course it'll likely take you most of a lifetime to actually read the whole thing (it's like 12 volumes of 1,500 pages each). i have it on audio and i've listened up until volume 8 or 9 i think. (I need to get back to it.) it took will durant almost 30 years to write it, and i think the final volume was published back in the 30's. but it is amazing. it was written way back in the first half of the 20th century (although i think it's since been revised) but all of it is still perfectly relevant. it starts at the very beginning of time and follows history up to the present day. but the reason it's so amazing isn't the information, but how it's presented. will durant has a way of telling the history in a way... how do i explain it? for the first time i saw history as a river -- flowing, with everything connected to everything else -- instead of just disparate facts like you learned in school, it all became part of a bigger picture. after listening to this, thinking i knew a lot about history, it was like discovering i was blind when all along i thought i could see. for the first time i came to understand how and WHY things happened and how one thing impacted another... he somehow allows you to "see all the dominoes"... is the best way i can explain it. it's like before i had seen a lot of dominoes, but now i was standing back watching each one topple the next and the whole inevitable line. that's the thing i think. history felt a lot more inevitable after reading durant's history. it was an eye-opening experience for me at the time (almost ten years ago) and has helped me put everything else i've learned since into a bigger context. i just can't recommend it enough. But it was an adventure well worth it. Like Page Smith, the Durants are primary historians, meaning that they have read an amazing number of works ranging from economics, to politics, to culture, to theology, and so on. AND their narrative is filled with extensive and fascinating quotations from these primary sources. I met so many wonderful new people in this venture (which took me two years to complete) that I found myself ordering some of those primary sources myself so that I could read even more of those persons' words. من فقط جلد مربوط به یونان و قرون وسطا رو خوندم. بخش قرون وسطاش جالب بود. جزئیات دادگاه های تفتیش عقاید و شکنجه ها و مخالفت های بعضی از فرقه های مذهبی (فکر کنم فرانسیسکن ها) با این دادگاه ها و اصلاً علت تشکیل این دادگاه ها به خاطر نهضت های بی دینی و طغیان های مردم شهرهای مختلف، و این که اعترافی که متهم، تحت شکنجه می کرد ولی بعداً از اعترافش بر می گشت، معتبر نبود و باید دوباره شکنجه می شد و دوباره اعتراف می کرد و آن قدر این چرخه ادامه می یافت که اعتراف تحت شکنجه اش با اعتراف بعد از شکنجه هماهنگ باش من فقط جلد مربوط به یونان و قرون وسطا رو خوندم. بخش قرون وسطاش جالب بود. جزئیات دادگاه های تفتیش عقاید و شکنجه ها و مخالفت های بعضی از فرقه های مذهبی (فکر کنم فرانسیسکن ها) با این دادگاه ها و اصلاً علت تشکیل این دادگاه ها به خاطر نهضت های بی دینی و طغیان های مردم شهرهای مختلف، و این که اعترافی که متهم، تحت شکنجه می کرد ولی بعداً از اعترافش بر می گشت، معتبر نبود و باید دوباره شکنجه می شد و دوباره اعتراف می کرد و آن قدر این چرخه ادامه می یافت که اعتراف تحت شکنجه اش با اعتراف بعد از شکنجه هماهنگ باشد!!! و خلاصه حاوی ماجراهای خنده آوری بود. فکر کنم به این نوع طنز می گویند "طنز سیاه" یا "طنز مرگ" یا همچون چیزی. در مورد یونان باستان هم جالب بود. بخش های سقراط و محاکمه و اعدام سقراط، شاگردش: افلاطون، و شاگرد افلاطون: ارسطو، و شاگرد جهانگشای ارسطو: اسکندر مقدونی. معمولاً اطلاعات ما نسبت به جهان گشایی اسکندر، از طریق منابع ایرانیه که به طرز غیر محققانه ای جانبدارانه نوشته شدن، اون هم راجع به واقعه ای که دوهزار سال قبل رخ داده و کمترین تأثیر واقعی ای روی زندگی کنونی ما نمی تونه داشته باشه. شخصیت اسکندر، خیلی خیلی جذاب تر از اون خون خوار سفّاکیه که توی کتاب های ایرانی-نوشت نشون داده می شه. اسکندر، البته یونانی و متمدن نیست، مقدونی و کمابیش وحشیه، اما از نژاد مقدونی خودش بیزاره و به جای فرهنگِ نداشته ی نژاد خودش، میخواد فرهنگ یونانی رو در مستعمراتش گسترش بده. اسکندر، شاگرد ارسطوئه و ارسطو کتاب معروف "اخلاق نیکوماخوس" و همچنین کتاب "ارغنون"، اولین کتاب منطق تاریخ رو برای اسکندر نوشته. همین کافیه که بدونیم با یه "چنگیز" مواجه نیستیم. با یه شخصیت خیلی پیچیده تر و صد البته جذاب تر سر و کار داریم. اما راجع به ارسطو، به نظر میرسید لحن کتاب، بدون دلیل، خصمانه میشه. صد در صد کسی از یه فیلسوف که آغازگر راه فلسفه ی تدوین شده است و تازه علم رو از پراکندگی دوره ی پیشاسقراطی در آورده، انتظار نداره که مثل محقق های هزاره ی سوم، که مرز و روش تحقیق هر علمی کاملاً مشخصه و ابزارها و کتب مختلفی راجع به هر علمی نوشته شده، رفتار کنه. اما انگار ویل دورانت این انتظار رو داره و پی در پی به خاطر اشتباهات ارسطو تمسخرش می کنه. لحن بیش از اندازه نیشدار، باعث میشه خواننده علیه نویسنده برانگیخته بشه، نه علیه اون کسی که نویسنده داره تمسخرش می کنه. الموسوعة كبيرة جدا .. لكنى احاول ان اقرا فيها قدر استطاعتى ..
Where do I begin? These books were the foundation of my intellectual journey. Durant was my greatest teacher. Every time I think of this collection, I am delightfully jealous at how the Durants could devote 45+ years to writing such an incredible undertaking. Although I found Volume I (Our Oriental Heritage) and II (The Life of Greece)somewhat distant as might be expected, they did start to engage more as time passed. Could also be that Durant too improved over time. My personal favorite was naturally The Age of Voltaire where it talked about market speculations, economic bubbles, and topics that would a Every time I think of this collection, I am delightfully jealous at how the Durants could devote 45+ years to writing such an incredible undertaking. Although I found Volume I (Our Oriental Heritage) and II (The Life of Greece)somewhat distant as might be expected, they did start to engage more as time passed. Could also be that Durant too improved over time. My personal favorite was naturally The Age of Voltaire where it talked about market speculations, economic bubbles, and topics that would almost be contemporary if you change a few words. ما می توانیم بر نویسنده ای که توانست ظرف پانزده ماه هلوِییز جدید (فوریۀ 1761)،قرارداد اجتماعی(آوریل 1762)، وامیل(مه 1762)را ارایه کند خطاهای بسیاری را ببخشیم. در امیل؛ روسو کار خود را با مردود دانستن شیوه های موجود تعلیم آغاز کرد، که این شیوه ها معمولاً بصورت افکار طوطی وار ،کهنه ، و فاسد بودند و هدف آنها عبارت بود از بار آوردن اطفالی مطیع و خود کار در یک اجتماع منحط، جلوگیری از استقلال تفکر و قضاوت طفل،و مسخ فکری او به طوری که بصورت یک فرد عادی با یک مشت گفته های پیش پا افتاده و تکرار های کلاسی ما می توانیم بر نویسنده ای که توانست ظرف پانزده ماه هلوِییز جدید (فوریۀ 1761)،قرارداد اجتماعی(آوریل 1762)، وامیل(مه 1762)را ارایه کند خطاهای بسیاری را ببخشیم. در امیل؛ روسو کار خود را با مردود دانستن شیوه های موجود تعلیم آغاز کرد، که این شیوه ها معمولاً بصورت افکار طوطی وار ،کهنه ، و فاسد بودند و هدف آنها عبارت بود از بار آوردن اطفالی مطیع و خود کار در یک اجتماع منحط، جلوگیری از استقلال تفکر و قضاوت طفل،و مسخ فکری او به طوری که بصورت یک فرد عادی با یک مشت گفته های پیش پا افتاده و تکرار های کلاسیک بار آید .چنین آموزشی کلیۀ انگیزه های طبیعی را دچار خفقان می کردو تعلیم و تربیت را بصورت غذایی در می آوردکه هر طفل آرزو داشت از آن احتراز کند. تعلیم و تربیت باید عبارت باشد از یک جریان سرور بخش نمو طبیعی، آموزش از طبیعت و تجربه،و پرورش آزادانۀ استعدادهای شخصی برای زندگی کامل و پر لذت. تعلیم و تربیت باید عبارت باشد از < هنر آموزش افراد > :راهنمایی آگاهانۀ جسم در حال رشد به سوی سلامت، رهبری خصوصیات اخلاقی به سوی اخلاقیات ،هدایت فکر به سوی عقل و خرد، و سوق دادن احساسات به سوی خویشتن داری، خلق خوی اجتماعی، و سعادت . Many people have this 11-volume set in their homes. It stands there on the shelf, prominently displayed, as evidence of the great erudition of the owner. My set is not particularly attractive on the shelf -- I bought the volumes from a used book store, and they look used. I might add that this is not the sort of book I normally read -- most of my readings are in the area of modern science, philosophy and some in religion. Yet quite literally I have read every word of every volume of this set. I Many people have this 11-volume set in their homes. It stands there on the shelf, prominently displayed, as evidence of the great erudition of the owner. My set is not particularly attractive on the shelf -- I bought the volumes from a used book store, and they look used. I might add that this is not the sort of book I normally read -- most of my readings are in the area of modern science, philosophy and some in religion. هذا الاختصار يفقد الموسوعة الأصلية اهم ما يميزها أي : القصة نفسها ..
تلك الأجزاء و المفردات و التفاصيل الكثيرة التي تنطوي عليها الموسوعة الكاملة تحذف هنا و يصبح الكتاب معها مجرد سرد لأحداث بدون تشويق التفاصيل .. تقضي على المتعة الحق أقول لكم . امتلك الموسوعة .. و أنا أعتبرها كنز قرائي لا يفنى .. قمت منذ فترة بعمل خطة قرائية لإنجاز القراءة لكامل الموسوعة .. و كانت كالتالي : 100 صفحة في اليوم .. ما يعني 10 أيام تقريبا لكل مجلد .. إذ أن كل مجلد ( النسخة التي لدي يحتوي كل مجلد منها على جزئين ) يحتوي هذا الاختصار يفقد الموسوعة الأصلية اهم ما يميزها أي : القصة نفسها ..
Stupendous and wide-reaching, this was a labour of love that spanned decades. Hard to imagine today's writers pulling this off. The good news is that it's wonderfully written and enchanting to read. The better news? It's plentiful enough to be found cheap second-hand if you take the time to look for it. A page turner. A must read if you want to understand civilization and how it evolved. Times have not changed. This is more than just a book, it enriches your life permanently. It also leaves you with a nice generally useful set of history books. This uniquely complete volume tells you all that most of us will ever need to know about Western Civilization and history until the fall of Napoleon. It's clearly written(Thank God! ),reasonably broad, bluntly and openly opinionated in many areas. It includes a very useful sketch of the progress of the west and detailed and interesting sketches of some of the mos This is more than just a book, it enriches your life permanently. It also leaves you with a nice generally useful set of history books. This uniquely complete volume tells you all that most of us will ever need to know about Western Civilization and history until the fall of Napoleon. It's clearly written(Thank God! ),reasonably broad, bluntly and openly opinionated in many areas. It includes a very useful sketch of the progress of the west and detailed and interesting sketches of some of the most important participants. It is about fifteen thousand pages. I wish I could tell you how long it took, but I can't even give you a good guess. Each volume stands on its own, however, and the best approach, I think, is probably just to dive into the book that sounds most interesting to you. I think if you read one you are very likely to spend a chunk of your life with them. In a word it is amazing. sloooooowly working my way thru audios, now avail via Overdrive and Hoopla!! not all avail on each but between them ought to *eventually* have access. Enjoy using history or philo, especially older, as pre-sleep treat, find it soothing, relaxing. currently beginning Volume III: CAESAR AND CHRIST. Even at 11 volumes, it is an overview of Western civilizaton. A reletivly easy read. given the complexity of the subject. The set takes a change of tone at volume VII. (Mr Durant has died and his wife finised the set from his notes.) The material is still quite excellent but she doesn't have the same confidence with it that he did. Actually, I haven't read the entire 11 volume set, but have read (on and off) most of the volume about the History of France under the reign of the Sun King, "Louis XIV" (Volume IV). I am listening on Audible as the time I have to sit still everyday was just used up by writing this brief comment! The narration is excellent (a must for me!) and I find the in-depth history fascinating! I have read so many books, both biographies and historical fiction, about so many eras, and I always find certain Actually, I haven't read the entire 11 volume set, but have read (on and off) most of the volume about the History of France under the reign of the Sun King, "Louis XIV" (Volume IV). I am listening on Audible as the time I have to sit still everyday was just used up by writing this brief comment! The narration is excellent (a must for me!) and I find the in-depth history fascinating! I have read so many books, both biographies and historical fiction, about so many eras, and I always find certain eras that I must get 'more'! I can see that these books by Will (and Ariel) Durant are a great resource for me to get the 'real stuff'. Although there are probably volumes where science and newer revelations may alter some details in some of these volumes I must say this is good enough for me! I intend to download several (many?) more volumes, and although I sometimes need to break away and read something in a different genre (there is a great deal of information and detail in this book!) I know I will come back over and over until I have read it all! From 1935 to 1975, author Will Durant wrote 11 volumes on Western history, finishing with the Napoleonic era only because he and his wife died weeks apart. His wife, Ariel, is a coauthor of several of the final volumes, and they both won the 1968 Pulitzer Prize for Nonfiction for the 10th in the series, "Rousseau and Revolution." "I've really been fascinated and inspired by reading books about history, because there's so much wisdom in understanding how these great people and great leaders built great organizations, led groups of people, and effected change," Holmes said. Though written in the early and middle of the 20th century, and thus somewhat dated on matters whose understanding has since been heavily revised by archaeological, paleontological, genetic, and documentary discoveries, this set remains the definitive baseline history of civilization. At 11 volumes, each totalling in the neighborhood of a thousand pages, it's an intimidating read, but Durant's style is thorough and personable, telling the grand story in detail while communicating methodology wel Though written in the early and middle of the 20th century, and thus somewhat dated on matters whose understanding has since been heavily revised by archaeological, paleontological, genetic, and documentary discoveries, this set remains the definitive baseline history of civilization. At 11 volumes, each totalling in the neighborhood of a thousand pages, it's an intimidating read, but Durant's style is thorough and personable, telling the grand story in detail while communicating methodology well, yet rarely getting bogged down in the dryness that has plagued more specialized (though excellent) works by historians such as Alan Gardener. I am outraged that when I went to pull this magnificent, one-of-a-kind 11 volume set of books up in the search bar, the author was listed as Will Durant, when the entirety of this opus was written by both Will Durant and his wife Ariel Durant! "The Story of Civilization," written over thirty years (1935-1975) and composing 11 volumes, chronicles, truly, our entire course of human civilization, for which they were awarded the Pulitzer Prize for General Non-Fiction in 1968 and the Presidential Meda I am outraged that when I went to pull this magnificent, one-of-a-kind 11 volume set of books up in the search bar, the author was listed as Will Durant, when the entirety of this opus was written by both Will Durant and his wife Ariel Durant! A wonderful detailed comprehensive history of Western Civilization. I read through all 11 volumes during about a 3 year period, and have since revisited 3 volumes (Caesar and Christ, The Age of Enlightenment, The Age of Voltaire). Durant writes in a way that is compelling even in mundane periods of the past, and is quite adept at summarizing complex situations with the turning of a thoughtful witty phrase. They were awarde William James Durant was a prolific American writer, historian, and philosopher. He is best known for the 11-volume The Story of Civilization, written in collaboration with his wife Ariel and published between 1935 and 1975. He was earlier noted for his book, The Story of Philosophy, written in 1926, which was considered "a groundbreaking work that helped to popularize philosophy."